Between moving furniture, taping, finally deciding on a color, and then digging into your pocketbook to pay for it, painting can be one of the least enjoyable home projects around. But, if you do it right, the benefits of a new paint color greatly outweigh whatever stress and hardship you endured while getting it done. Okay, so here’s a secret about paint: there are so many small, nuanced variations between shades of color that you do not actually need to sweat over two paint colors that are slightly different. Repeat: don’t sweat over small differences. But, if it’s your jam to obsess over the difference between Robin’s Egg Blue and Teal Moonbeam, go right ahead. Here’s your basic answer: color affects mood. Blue paint will have a different effect on your mood than red paint. And a dark blue will put out a different vibe than light blue. So when you’re looking for paint, think about what space you’re painting, and what you want the feeling to be in that room. Go for colors that jive with how you want people to feel while they are sitting in that specific room. Once you’ve chosen the right color and the right color value (how light or dark it is), you can rest assure that tiny differences between shades will not matter all that much in the long run. 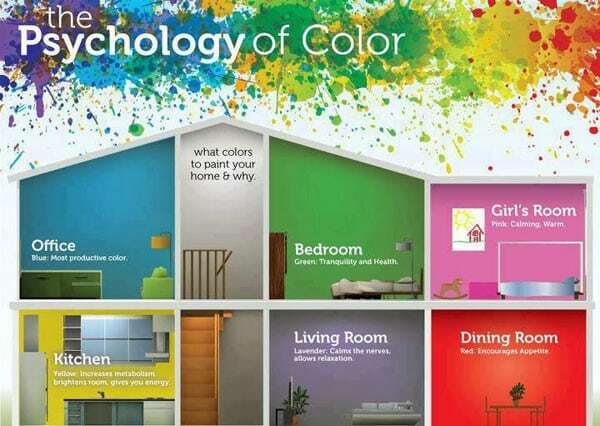 The psychology of color and how it can affect your mood in the home. Red and Orange: the highest energy colors. Great for: living or dining rooms–anywhere you’d like to stir up a conversation. Also a great option for exercise rooms. Not great for rooms where you want to have high energy. Also, you want to be careful with blue. If it’s a dark blue, it can have a saddening effect. You’ll want to make sure if you use a dark blue that you add a warm color accent throughout the room. Great for/Not great for depends on the shade. Dark purples, follow the same rules as red/orange. Lavenders, follow the same rules as blue. Color can blend in with your environment or compliment it, you have lots of options. Plan your colors around “permanent” aspects of your home, such as roof color, stonework, and cement. Research your home’s architectural era. Maybe there is a classic color that can restore some of its original charms. Look around your block. 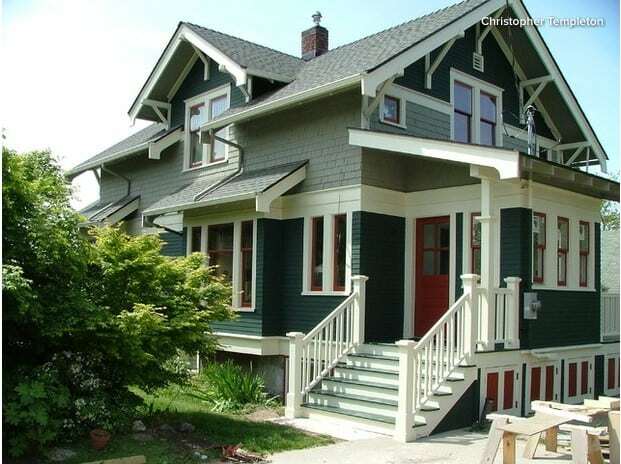 If there are a few houses with funky accent colors–go for it! Doors, fences, and mailboxes can be fun items that can jazz up an otherwise neutral palette; however, if your block is pretty reserved as far as color goes, don’t be that guy. Don’t do a flamingo pink all over. Don’t even do flamingo pink accents. Keep your resale value high, keep your house aligned with the neighborhood style. If you’re ready to choose paint colors, view this video for ideas on how to tie in an all-over color, shutter colors, and accents. Painting can be stressful. Do you know what’s stress-free? LeafGuard® brand gutters. Fortunately, they come in a variety of colors, so once you’re done choosing your color scheme for your home, we can add to the curb appeal with new gutters. Contact us at Home Solutions of Iowa when you’re ready! The crew was outstanding and made sure my concerns were answered before leaving. I am very happy. - Sharon S.
They were organized and professional, which is helpful when I could not be there the whole time. - Shawn K.
I was extremely satisfied with the respect they showed my property, my wife, and myself. - Stanley V.
The installation crew was excellent. - Steve F.